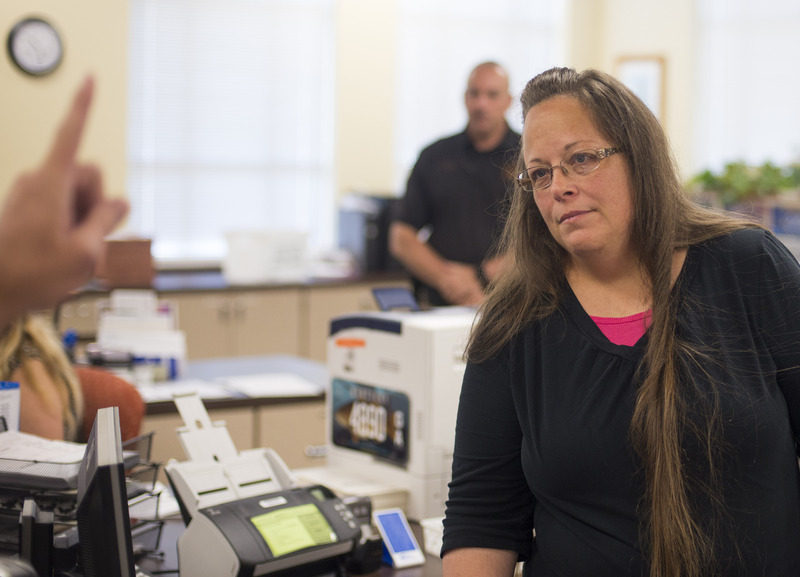 As a Kentucky clerk continues to deny couples marriage licenses due to religious beliefs, the higher authority finally weighed in on Wednesday when God chatted with the ACLU about Kim Davis. Well, not God exactly, but rather the Twitter account @TheTweetOfGod, who's kind of close enough. What ensued was a hilarious and kind of weird interaction between God and the American Civil Liberties Union in what might go down as the strangest Twitter thread ever. The conversation, of course, focused on Davis, the Rowan County clerk who is protesting the Supreme Court marriage equality decision by refusing to grant marriage licenses to anyone in her county. Despite being ordered to issue licenses and having her request for a stay be denied by both an appellate court and the U.S. Supreme Court, Davis is still refusing to issue licenses. On Tuesday, the ACLU national and Kentucky branches each filed motions urging a district judge to find Davis in contempt of the court, which is punishable by either jail time or heavy fines. Davis is due to appear in court on Thursday, at which point the nation will find out what comes next for her. Although Davis currently has no legal right to withhold marriage licenses, she has said that she is acting under "God's authority." On Wednesday morning, God decided to weigh in, tweeting, "To answer the two obvious questions: 1. No, I did not give her the authority. 2. Yes, she's a closet lesbian." In a brilliant PR move, the official ACLU national Twitter account decided to respond, and thank God for his support. Then, the ACLU and God kind of bro-ed out a bit. It was cute. God even had some helpful suggestions for the ACLU. God also asked some hard-hitting questions. Then, the ACLU remembered God's lesbian joke and wanted to have a few words. Needless to say, everyone watching this go down on Twitter was thrilled. Unfortunately, there's no word yet on whether Davis has released a statement regarding God's comment. Perhaps God will chime in again on Thursday after the hearing.